Fluorescent lamps have been around for many decades now and over the years have proved their versatility, energy saving capability and lighting efficiency. They are the precursors of the compact fluorescent lamps (CFL), which is one of the most popular lighting solutions available today. Fluorescent lamps come in many shapes and sizes. T8 fluorescent lamps were introduced in the US way back in 1981. The ‘T’ in T8 stands for tubular. 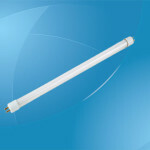 The T8 fluorescent lamp is one inch thick and is commonly available as a linear lamp that is four feet long. However, they are also available in different lengths, linear and U-shapes, different wattages and a variety of colors. The lamps have a glass tube with a phosphor coating on the inside. The color and output of the lamp is controlled by a component called the ballast. In the days of the traditional ballasts there was another component called a starter. These days the two have been replaced by high frequency electronic ballasts that provide an instant startup instead of the flickering start of the traditional ballast. It also allows the lamp to work in a wider voltage range. 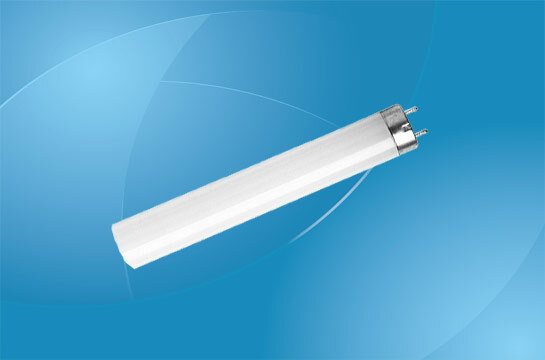 Over the years, manufacturers have made many improvements to T8 fluorescent lamps to increase their performance parameters like light output, efficacy, lifespan and color. Energy efficiency: They consume less power. Life: They last longer than filament lamps. Quality of light: They minimize glare and thick shadows. Cooler: They produce less heat than filament lamps. The life of a T8 lamp can vary from 20,000 to 30,000 hours depending upon the manufacturer, cycle of usage and the type of ballast used. Longer usage cycles result in longer life. A poor quality ballast can shorten the life of the lamp by up to 50%. In general, the energy-efficiency of a fluorescent lamp increases with reduction in the thickness of the tube. Thus the T8 is much more energy-efficient than the T12. T8 lamps are available with light output values ranging from 2800 to 3200 lumen in increments of 50 lumen. The light output is not constant throughout the life of the lamp. Initially it gives a much higher light output and as the lamp gets older the light output slowly decreases. Light output also depends on the quality of the ballast used. 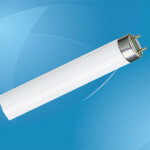 T8 fluorescent lamps are available in many colors. However, the most popular colors are white, warm white, daylight, cool white, universal white and tropical daylight. All fluorescent and CFL lamps contain a small amount of mercury. Mercury is a poisonous substance to living beings and harmful to the environment. There is no risk of any harm or environment contamination unless the lamp is broken, which is very rare. Spent lamps should be recycled. Shops, restaurants and other outlets. Street lighting and tunnel lighting. Plant cultivation and animal farms. 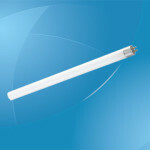 A T8 fluorescent lamp is a tried and tested lighting solution. It is energy efficient and can be used for a wide variety of applications. It is important to use it with an appropriate ballast to ensure optimum performance, energy-efficiency, light output and lifespan.